Congratulations to the winners of the tournaments at Euro Quest V. Eventually, each will be listed on the GCOM Euro Quest website. Until then we salute you on the corrresponding updated event results	pages (click on the game box covers below). 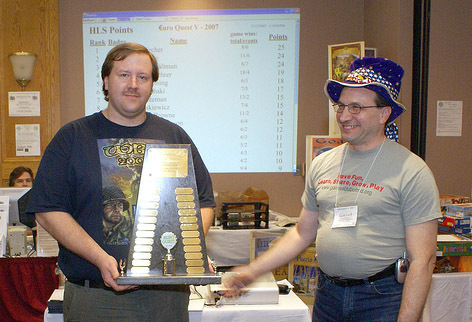 Congratulations to Rob Kircher of Rhode Island who defeated a pair of Pennsylvanians, Alex Bove and Mike Kaltman, by a single point to win the Harold L Siegelman Award for Top Individual Performance at Euro Quest V. The Euros conference again grew in size with nearly 250 attending over the four-day weekend with 12 tournaments vying for attention with Open Gaming opportunities. The latter was again enhanced by Tom McCorry's gracious demonstration of the newest releases from Essen and several vendors with new products. Individual event winners were: Eric Freeman (Wild Card), Tom Dunning (Ra), Thomas Browne (Saint Petersburg), Brian Reynolds (Settlers), Rob Kircher (Thurn & Taxis), Virginia Colin (Ticket to Ride), Peter Putnam (Caylus), Alex Bove (Goa), Peter Eirich (Imperial), Joe Jaskiewicz (Power Grid), Lyman Moquin (Princes of Florence), and Sam Atabaki (Puerto Rico). Last updated 11/28/07 by kae.